This Grammar.com article is about Theater vs. Theatre — enjoy your reading! Should we go watch a movie in a theatre or a theater? English learners and speakers sometimes find it confusing when there are two spellings of a single word on their minds and they can’t choose which ones are right. Theatre (or theater) is one such confusing word with two spellings that are common but which one is right? If you are fighting with your subconscious about what are the acceptable spellings of theatre, keep reading further. The word theatre originated from late Middle English: from Old French, or from Latin theatrum, from Greek theatron, from theasthai which means ‘behold’. Theatre is used as a noun in English language where it means a building or outdoor area in which plays and other dramatic performances are given; a cinema. There's a good play on at the theatre. The activity or profession of acting in, producing, directing, or writing plays is also known as theatre. What made you want to go into the theatre? Theatre is also a play or other activity or presentation considered in terms of its dramatic quality. Julius Caesar is an intense, moving, and inspiring theatre. A room or hall for lectures with seats in tiers is sometimes called theatre too. A room where surgery or operation is performed is also called a theatre. Respiratory function is carefully controlled and monitored throughout the patient's stay in theatre. Theatre is also used to denote weapons intermediate between tactical and strategic. He was working on theatre defense missiles. Theater and theatre are different spellings of the same word described above. The main thing that most English speakers and learners need to know is that theater is the preferred spelling in American English, and theatre is preferred virtually everywhere else. The American preference for theater is a late-20th-century development (though the spelling itself is a centuries-old variant), so it is understandable that some people still resist it, and its newness means that exceptions are very easily found, but in this century the preference is entrenched. Some Americans do make distinctions—for instance, that a theater is a venue while theatre is an art form, or that a theater is a movie theater while a theatre is a drama venue. When to use which spellings? Remember that if you belong to America you should use theater instead of theatre as these are the spellings found in American English but if you live in England specifically or Europe generally you should use theatre. If however, you reside in an English speaking country other than Europe or America, the spellings you choose are of your choice or preference but stick to whatever you choose throughout your writing. 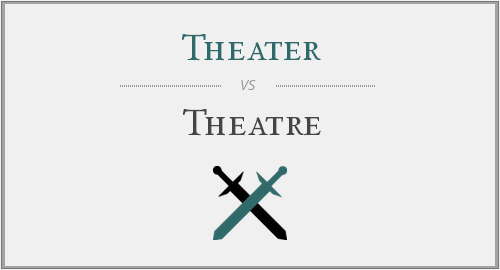 "Theater vs. Theatre." Grammar.com. STANDS4 LLC, 2019. Web. 22 Apr. 2019. <https://www.grammar.com/theater_vs._theatre>.